Suddenly, unbelievably, the residency was approaching its end. We had reached the encores of the last show. Each passing moment was becoming ever more precious. A strong version of the acoustic classic “It Ain ‘t Me, Babe” opened the encores. This had grown into one of his most bonding live songs: both singer and audience aware of the irony of greeting its lyrics of denial with such a rapturous reception. The traditional “Hang Me, Oh Hang Me” (aka. “I’ve Been All Around The World” or “The Blue Ridge Mountains”) was sung by Dylan in a throaty but deeply satisfying growl. Deep bass lines and simple guitar strokes lent gravity. For a man who had been criss-crossing continents for the past five years, the sentiments of “Lord, Lord, I’ve been all around this world” seemed fitting. A hush came over the hall. It was one of the most perfect moments of my life. Then a blistering, rip-the-paint-off-the-walls “Highway 61 Revisited” brought the whole thing to a rousing, exhausting finish. It was a long time before many of us left the hall , so reluctant were we to leave the scene of our extraordinary experience. What a terrific show. Amazing set list. Emotional observations from Andrew Muir offer the perfect spice. 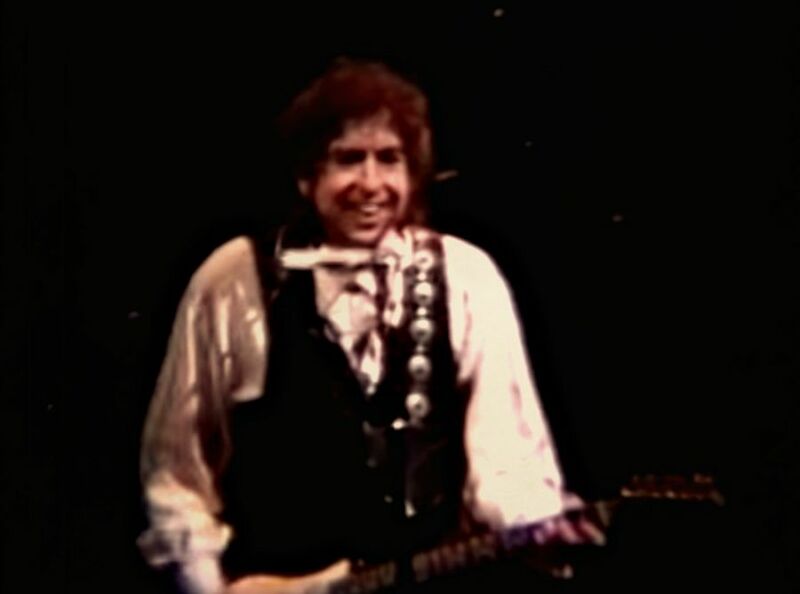 … Bob jumping around on guitar, back when he was a “song and dance man,” is hard to beat. Live versions of “Where Teardrops Fall” and “Every Grain of Sand” are real nuggets. Springsteen once said that if you want to know the meaning of life, listen of “Every Grain of Sand.” It’s all in there. Here’s hoping he or his record company release a live version one day in the near future. Great show, I was there. saw all 6 nights, great shows. this one had a real party atmosphere. one of my favourites of all concerts I’ve seen.